Lemon Pepper Chicken with Creamy Garlic-Lemon Sauce – skin-on, bone-in chicken thighs seasoned with lemon-pepper seasoning, baked to perfection and served with the garlic-lemon cream sauce! YUM! The recipe takes only 40 minutes from start to finish. Fantastic idea for a quick weeknight meal! Easy dinner that a whole family will love! I used store-bought Lemon Pepper Seasoning with Garlic & Onion. Store-bought seasoning works just great, and the ingredient list usually lists lemon peel, black pepper, onion, garlic, lemon juice flavors. If you want to make your own, here is a recipe for homemade lemon pepper seasoning. 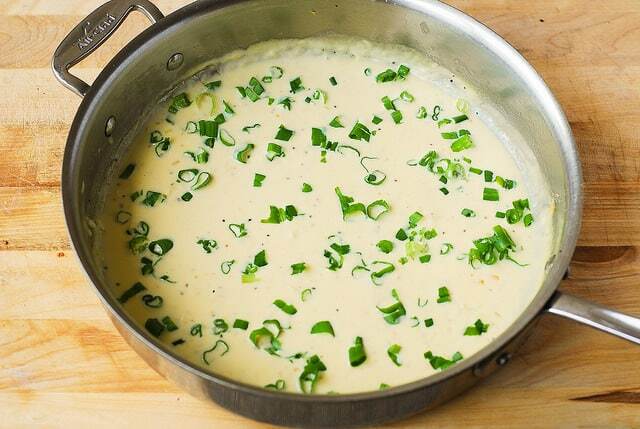 While the chicken bakes, make the cream sauce. This will save you time, and the whole recipe will take 40 minutes to make from start to finish, including the baking time of 20 minutes. To make the cream sauce, bring all the liquids (chicken broth and heavy cream) to boil, add shredded Parmesan cheese and keep stirring at all times as the cheese starts to melt. Reduce the heat pretty much immediately and continue stirring the sauce on low simmer heat until all the cheese is completely melted, and the creamy sauce forms. You can use shredded Mozzarella cheese in place of shredded Parmesan cheese. To make this recipe gluten-free, use gluten-free flour to coat the chicken with. You can use chicken breasts or boneless skinless chicken thighs instead of chicken thighs. Just be sure to watch the baking times – depending on the thickness of the chicken breasts or boneless skinless chicken thighs, the baking time might have to be reduced. 1) Mix 3 teaspoons of lemon pepper seasoning with flour. Pat the tops (skin side) of chicken thighs with this seasoning mixture. 2) Heat 2 tablespoons olive oil on high-medium heat in a large skillet. 3) Add chicken thighs skin side down and cook for about 4 minutes on high-medium heat until browned, uncovered. 4) Sprinkle the other side of chicken with 1 teaspoon more of lemon pepper seasoning. 6) Line baking sheet with aluminum foil. 8) In the meantime, while the chicken is baking, make the sauce with garlic, chicken stock, heavy cream, lemon pepper seasoning, and shredded cheese (Parmesan, Mozzarella, or both). 10) Add cooked lemon pepper chicken thighs to the skillet on top of the sauce. Greens: Cook some spinach, or other greens, such as Swiss chard, or kale. Here is a recipe for a simple sautéed spinach – you can cook pretty much any leaves using this recipe. Green beans: Simple cooked green beans will do. If you want something a bit more interesting, try these easy garlic and bacon green beans, sautéed in olive oil and butter in a skillet on stove top. Potatoes: Serve mashed potatoes, roasted potatoes, or try this refreshing cilantro-lime potato salad. Rice: Serve rice pilaf or any kind of flavored rice that you can buy in the store in a package. You can also serve this with wild rice, which is delicious with this lemon pepper chicken. Chicken Thighs with Creamy Bacon Mushroom Thyme Sauce – KETO friendly, high-fat, low-carb, gluten-free chicken recipe. Fantastic for bone-in, skin-on chicken thighs! 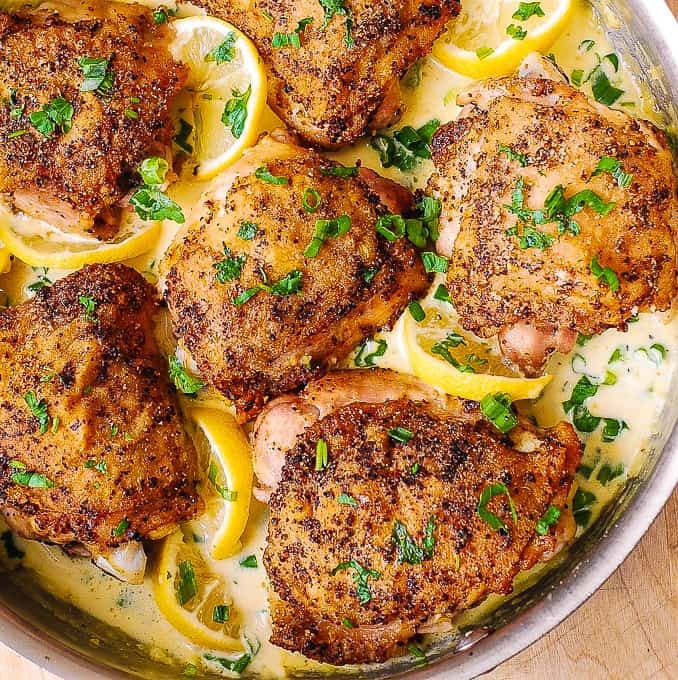 Pan-fried chicken thighs in a creamy bacon sauce with a touch of lemon. Skillet Chicken Thighs with Creamy Tomato Basil Spinach Sauce – made with boneless skinless chicken thighs. 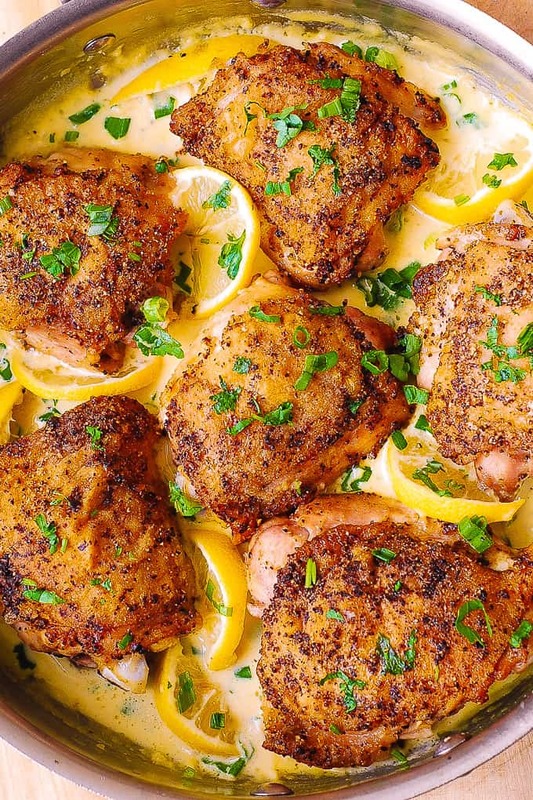 Skin-on, Bone-in Chicken thighs seasoned with lemon-pepper seasoning, baked to perfection and served with the delicious, cheesy, garlic-lemon cream sauce! 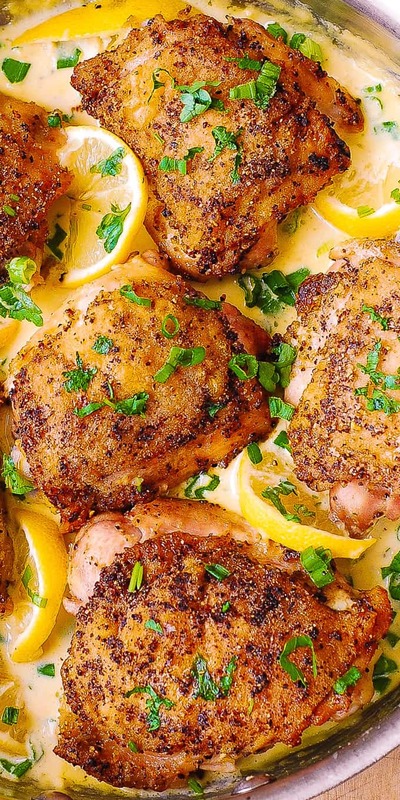 This Lemon Pepper Chicken with Creamy Garlic-Lemon Sauce takes only 40 minutes to make from start to finish (including baking time!). Perfect recipe for a busy weeknight. Mix 3 teaspoons of lemon pepper seasoning with flour. Pat the tops (skin side) of chicken thighs with this seasoning mixture. Heat 2 tablespoons olive oil on high-medium heat in a large skillet. Add chicken thighs skin side down and cook for about 4 minutes on high-medium heat until browned, uncovered. 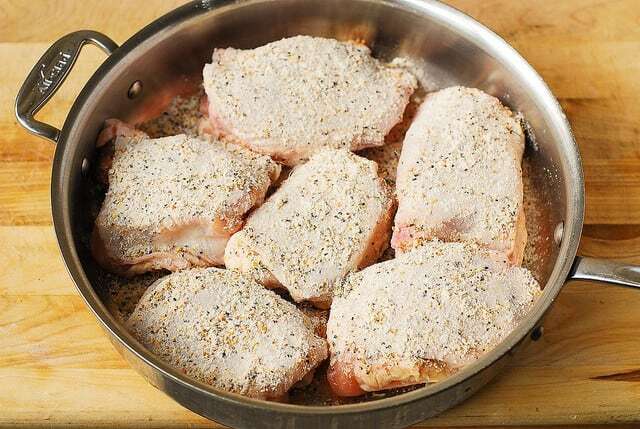 Sprinkle the other side of chicken with 1 teaspoon more of lemon pepper seasoning. Flip the chicken thighs over and cook for 2 minutes on the other side. Remove from heat. Line baking sheet with aluminum foil. 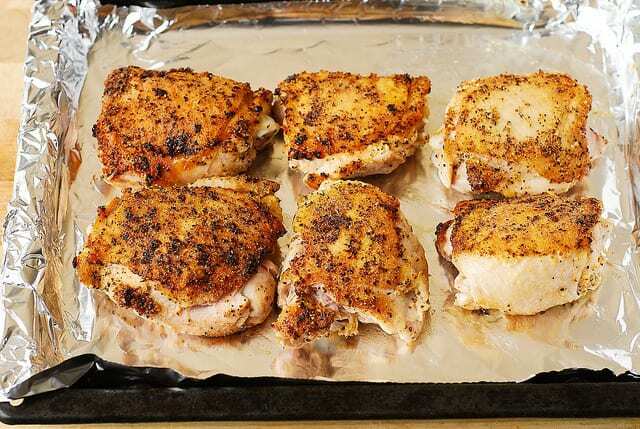 Place chicken thighs skin side up (crispy side up) on the baking sheet and bake at 375 F for about 15-20 minutes, until the chicken is fully cooked, the juices run clear and the chicken is no longer pink in the center. In the mean time, while the chicken is baking, make the sauce. 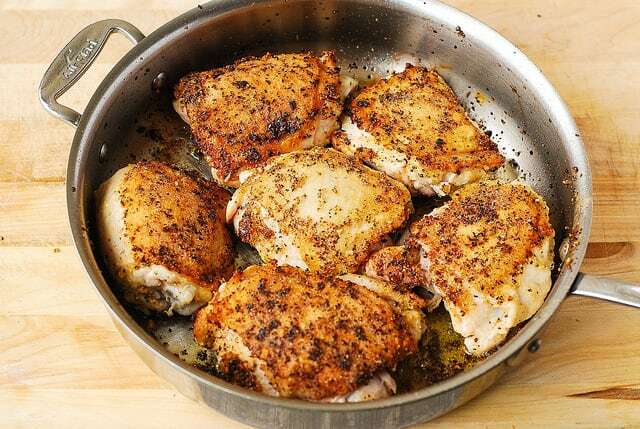 Thoroughly clean and dry the skillet you used for cooking chicken thighs. Heat 1 teaspoon olive oil and 1/2 tablespoon butter on medium heat in this cleaned skillet. Add minced garlic and cook, constantly stirring, for about 30 seconds. Add chicken stock and 1 teaspoon lemon pepper seasoning to the skillet and bring to boil. Add heavy cream and bring to boil. Add shredded cheese and stir until melted. Reduce heat to simmer and keep stirring until the sauce is smooth. Remove from heat. Add 2 tablespoons freshly squeezed lemon juice and stir in. Top with chopped green onions (chop up only green portion of green onions and don't use white portion). Keep the sauce covered. The lemon pepper chicken should be cooked by now. Check it for doneness and if chicken is completely cooked through, add it to the skillet on top of the sauce and on top of green onions. Top with chopped parsley and decorate with a few slices of lemon. The recipe was originally published on January 6, 2016 and republished with cooking tips and updates in June 2018. This is by far the best chicken dish and sauce I have made, that the rest of the family totally enjoyed, so much so that were going to repeat. Btw it paired well with white and wild rice pilaf. So glad you enjoyed this recipe! Great idea to serve this with wild rice pilaf! Can we do this recipe with boneless, skinless chicken breasts ? Yes, you can! You might have to reduce the cooking times for boneless skinless chicken breasts. They usually cook faster than skin-on bone-in chicken thighs. 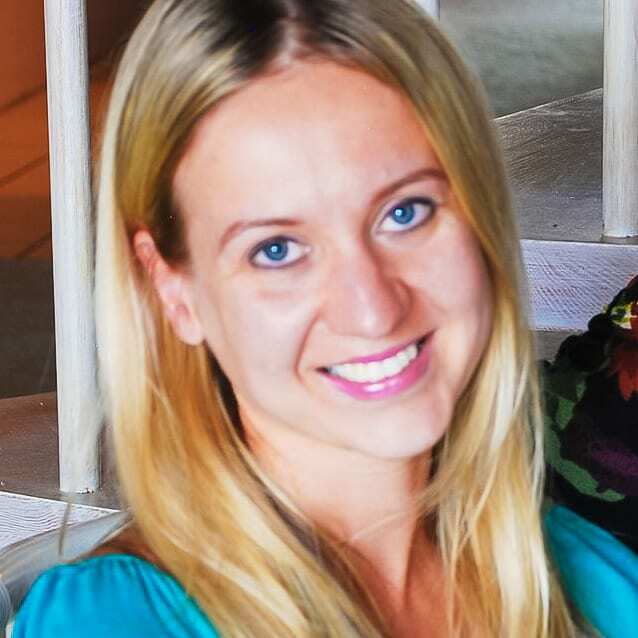 Kathie, I am so happy you enjoyed this recipe! What a great idea to use trout and salmon instead of chicken – brilliant!